We have seen previously that photovoltaic cells use light to generate electricity and that there are a number of different types of photovoltaic cell technologies available, including monocrystalline, polycrystalline and thin-film cells which can all be used to produce a Photovoltaic Panel. The electrical power in Watts, generated by these different photovoltaic cells when exposed to direct sunlight is roughly the same for each panel and is given as the product of the voltage times the current, ( P = V x I ). The amount of electrical power generated by an individual photovoltaic cell at its output terminals depends upon the amount of solar radiation that hits its PN junction as well as the percentage of solar radiation it actually converts into electricity, in other words its efficiency. An individual photovoltaic cell produces an “Open Circuit Voltage” ( VOC ) of about 0.5 to 0.6 volts at 25oC (typically around 0.58V) no matter how large they are. This cell voltage remains fairly constant just as long as there is sufficient irradiance light from dull to bright sunlight. Open circuit voltage means that the PV cell is not connected to any external load and is therefore not producing any current flow. When connected to an external load, such as a light, the output voltage of the individual cell drops to about 0.46 volts or 460 mV (460 millivolts) as the electrical current begins to flow, and will remain around this voltage level regardless on the sun’s intensity. This decrease in output voltage is caused by resistance and power losses within the cells structure as well as the metallic conductors deposited on the cells surface. Temperature also affects a photovoltaics output voltage. The higher the temperature is, the lower the cell’s output voltage becomes as the cell degrades under the hot conditions. So in full sun the output voltage reduces by about 5% for every 25°C increase in cell temperature. Then photovoltaic panels with more solar cells are recommended for very hot climates than would be used in colder ones in order to offset power output losses due to high temperatures. Unlike a photovoltaic cells voltage, the output DC current ( I ) however, does vary in direct relationship to the amount or intensity of the sunlight (photon energy) falling onto the face of the PV cell. Also the output current is directly proportional to the cells surface area as the larger the cell the more light energy enters the cell. Then the more sunlight entering the cell, the more current it produces. Photovoltaic cells with high current outputs are generally more desirable, but the higher the current output, the more they will cost. We have said previously that the power output of a photovoltaic solar cell is given in watts and is equal to the product of voltage times the current ( V x I ) and this is true. The optimum operating voltage of a PV cell under load is about 0.46 volts at the normal operating temperatures, generating a current in full sunlight of about three amperes. Then the power output of a typical photovoltaic solar cell can be calculated as: P = V x I = 0.46 x 3 = 1.38 watts. Now this may be okay to power a calculator, small solar charger or garden light, but this 1.38 watts is not really enough power to do any usable work. However, individual solar photovoltaic cells can be electrically connected together in series (daisy chained) to achieve the desired voltage as series voltages add, or connected in parallel (side-by-side) to achieve the desired current as parallel currents add. Then any combination of two or more PV cells can be connected together in either a series and/or parallel combination to give any desired voltage, current and power output producing a photovoltaic panel. In practical usage, the photovoltaic cell operates in the linear part of its I-V characteristic curve and supplies approximately the same current as at short circuit. The power delivered by the pv panel to a battery and load connected in parallel with the panel is: P = V x I. For example, if we connect together in series, ten 0.46 volt PV cells from our last example to produce a solar photovoltaic panel, the new output voltage would be 0.46 x 10 or 4.6 volts, but the current remains the same at 3A (series circuit). Then the total power output has also increased ten fold to 13.8 watts peak power. Individual solar photovoltaic cells can be connected together to produce a larger “solar photovoltaic panel” or solar module as they are also called, with power outputs of 50 to 200 plus watts peak possible. In practice, for improved efficiency and practicality, multiple PV cells are wired together in a series and/or parallel combination to produce the required voltage and peak power output. The number of individual PV cells require to complete a single solar photovoltaic panel really depends on how much power you require and the type of PV cells being used, monocrystalline, polycrystalline or thin film. Photovoltaic panels come in all sorts of configurations and sizes to help you meet your energy needs. Most PV panel manufacturers produce standard solar panels with output voltage of 12 volt and 24 volts. The design of these standard solar photovoltaic panels generally consist of 36 crystalline silicon cells which has evolved from the need to charge a 12 volt battery. A typical 12 volt photovoltaic solar panel gives about 18.5 to 20.8 volts peak output (assuming 0.58V cell voltage) by using 32 or 36 individual cells respectively connected together in a series arrangement which is more than enough to charge a standard 12 volt battery. 24 volt and 36 volt panels are also available to charge large deep cycle battery banks, and as the photovoltaic panels are made of the same basic PV cell, they are all rated at about the same DC current. If a 24 volts output solar panel is required, then there will be 64 or 72 individual cells within one single solar panel. To obtain the required 24 volt output, two 12 volt panels are effectively wired together in series, usually with a jumper, allowing the solar panel to output the required 24 volts. 24 volt solar panels have a much higher open circuit voltage ( VOC ) in the mid to high 30’s, and have a larger peak wattage value, from 150 watts and upwards. Photovoltaic solar cells are said to be connected in “series”, when they are daisy chained together in a single line. Since the current generated by the first cell has no other way to go it must also pass through the second cell and the third and so on. Then, solar cells in series have a Common Current flowing through them as the current that flows through one PV cell must also flow through the others within the panel as it can only take one path. Then the amount of current that flows through a set of photovoltaic cells in series is the same at all points in a series circuit. Photovoltaic Panels or solar modules are made up of multiple cells which are cascaded together in series and encapsulated in an environmentally friendly casing producing a single solar module with a higher voltage output than with just one single PV cell as shown. In our example above, four photovoltaic solar cells are connected together in a series combination. If we assume that the output voltage produced by each individual PV cell in the chain is 0.5 volts, then the combined output voltage will be the sum of the individual cells output voltage and this is calculated as: V1 + V2 + V3 + V4 = 0.5V + 0.5V + 0.5V + 0.5V = 2.0V. For series connected cells, the combined output current is the same as that produced by each cell, then: I1 = I2 = I3 = I4 = Itotal. The combined power is the sum of the individual cells power or the product of the voltage times the current as seen previously. There is one major disadvantage of series connected solar cells. An undesired effect occurs when one solar cell becomes faulty, damaged or is partly or fully shaded from the sunlight. Even if only one solar cell is (partly) shaded, the effect is the same as if ALL the series connected cells are shaded resulting in a complete loss of power output. Also there is the risk that full current from the rest of the cells will pass through the shaded cell and cause overheating damage called “hot spot heating”. Then it is important for the operation of a series connected photovoltaic panel to avoid even slight shadows across its cells. To avoid electrical damage to the cells, so-called “bypass diodes” are connected in parallel with each PV cell as shown, one bypass diode for each solar cell. The presence of the bypass diode limits the voltage across the bad cell in its reverse bias to pass a certain current. The bypass diode conducts, thereby allowing the current from the good solar cells to flow in the external circuit. The maximum reverse over voltage across the bad cell is reduced to about a single diode drop so that larger voltage differences cannot arise in the reverse-current direction across the cell, thus limiting the current and preventing over heating due to less power being dissipated. Ideally, we would have a bypass diode for each individual PV cell, but in practice there would be one bypass diode for a number of cells. Photovoltaic solar cells are said to be connected together in “parallel” when both of their terminals are respectively connected to each terminal of the other PV cell or cells. Unlike the previous series configuration, in parallel circuits the current can take more than one path and because there are multiple paths the current is not the same at all points in a parallel circuit. However, the voltage generated across all of the cells in a parallel circuit is the same. Then, Photovoltaic Cells in Parallel have a Common Voltage across them and is true for all parallel elements. In our example above, the four photovoltaic solar cells are connected together in a parallel combination. For parallel connected cells, the combined output voltage is the same as that produced by each cell, then:V1 = V2 = V3 = V4. If we assume that the output current produced by each individual PV cell in the chain is 1.0 ampere, then the combined output current will be the sum of the individual cells output currents and this is calculated as: I1 + I2 + I3 + I4 = 1.0A + 1.0A + 1.0A + 1.0A = 4.0A. Then we can use parallel connected photovoltaic solar cells to boost current output. The combined power is the sum of the individual cells power or the product of the voltage times the current. We said previously that we can have a current mismatch for series connected solar cells due to shading or a faulty cell and that the good cells bias the bad cell causing large amounts of power to be dissipated into the bad cell which in turn causes what is generally called “hot spot heating”, severely damaging the solar panel. In a parallel connected solar photovoltaic panel, a mismatch in voltage can be more drastic. If we use nominally identical solar cells to construct our photovoltaic solar panel then why is there cell voltage mismatch?. In our simple parallel example above, we have assumed that each cell generates 0.5 volts but this is not always the case. At low current outputs (dull days), this mismatch of voltages is generally not a problem. However as the panel current increases the bad cell stops generating power and now dissipates or consumes power reducing the output voltage of the solar panel. Just like series connected cells, the effects due to cell shading, degradation of cells, damage etc, all mean that in practice we can have mismatches between the PV cells. A parallel connection is less sensitive to this type of shading mismatch as it is a voltage mismatch that creates a bigger problem. So why not connect cells in photovoltaic panels and modules mainly in parallel, because in reality most cells are connected in series as we need to boost the output voltage. The preferred solar photovoltaic panel for most solar charging applications is a 36 cell module which delivers about 21 volts open circuit voltage assuming a peak cell voltage of 0.58 volts reducing down to about 16.5 volts under full load conditions. A 36 cell solar panel is better for very hot climates in order to offset power output loss from the higher operating temperatures. Do not forget, that a photovoltaic panel is sat in the sun all day!. Also the extra voltage compensates for voltage drops in the system with long cable runs. We have said previously that the individual Photovoltaic Solar Cell is the basic building block of a complete photovoltaic panel or module and one of the great advantages of building solar panels is that they can be built the exact voltage and current requirements needed for your particular project by adjusting the type and quantity of the cells. The photovoltaic cells may be connected in parallel to achieve the desired current or connected in series to achieve the desired voltage and then placed in a glass covered housing and hermetically sealed for protection against corrosion, moisture, pollution and weathering. 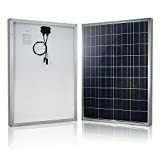 The Photovoltaic Panel can be used singly, or connected together in parallel and series with other solar panels and modules to produce a larger solar array with a greater current and voltage output. These arrays can the be arranged as panels on a buildings roof or walls, and can often feed the solar electricity directly into a building. With the latest PV technology, cells can also be integrated into the roof tiles themselves. Groups of solar PV cells can be added together to provide increasing levels of power. In the next tutorial about “Solar Power”, we will see that to maintain the maximum power output and improve the efficiency of a photovoltaic panel, the PV panel must constantly face the sun. This can be achieved by using a technique called Solar Panel Orientation to automatically track the movement of the sun across the sky between early morning and late night, or by manually setting the angle of the PV panel towards the sun and then adjusting it each day. I have 6 kva solar system and 100 h 8 battery and 250 w 30 panels. What shold be pv volt at its peak . Now pv volt is just 115 . If the efficiency of solar PV module is 15% and its rated power 60 watt, what should be roughly physical size of module? Please answer me before evening.. I have a 250w panel. The glass shattered. The V=34.6 but the A=0.4. Is this possible? Possibly if the panel is damaged, or you are measuring open-circuit values. I need 50 volts pv output voltage help me? Four PV panels in series. If i have a PV cell of 0.6 V and 3.4 A rating, how can i get an array of 40 V annd 13.6 A? An array of 67 cells x 4 rows giving 268 PV cells in total. What happens to the output current when 4 parallel panels are connected but one of them has only half of the radiation. Hi, I have PV panels, In that 12 cells are grouped with one bypass diode. Can I add two more cells in series with those 12 cells without diode (12cells with diode +2 cells)? Will it increase voltage? PV cells or panels in series increase voltage. PV cells or panels in parallel increase current. Well first of all thanks , this article was very helpful for me as i didn’t know about bypass diodes. Now i came to know their importance. Other thing i want to ask is that what diode values should we use? e.g i have 2 panels (12V each) connected in series so it makes 24 V.should i use diode whose rating must be +24 V? I just read 1 chapter “Photovoltaic Panel converts Light into Electricity”, gained a lot about solar cell & panels, I appreciate & subscribe your newsletters.